The Piping Live! Festival is held every year in Glasgow by the fine folks at the National Piping Centre, it’s about to go into it’s 12th year and has been described as the largest bagpipe festival in the world! It’s running this year from the 10th till the 16th of August and is going to bring something unique and special to the city of Glasgow with performances all around the city. These one’s seem to be free and there are several more, all reasonably priced, occurring over the week. For more information you should 100% check out the Piping live! website (the events page specifically) which can be found here. 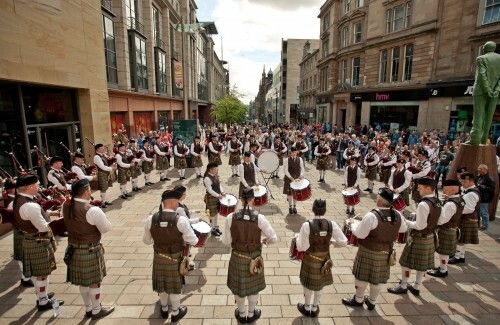 While you’re at it might be worthwhile to give them a wee follow on their twitter feed @GlasgowPiping. Curiously there are several stories on the website stating that the festival already kicked off back in the Springtime which means that people have been able to enjoy performances around the city for a lot longer in the build up to the festival proper in August. The artists in attendance make up an exhaustive list of the who’s who of piping in Scotland and around the world including performers from New Zealand, Columbia and Belgium! We’re definitely going to make our way down to a few of the performances as this is a unique opportunity to catch a ton of bagpipes! 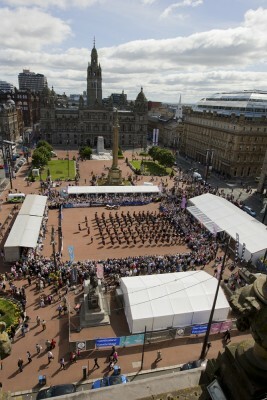 Overall the organisers expect 50,000 people to enjoy the 200 events and 8,000 performers (!) that make up the festival! Can’t wait!! ← Happy wee dog singing along with bagpipes.